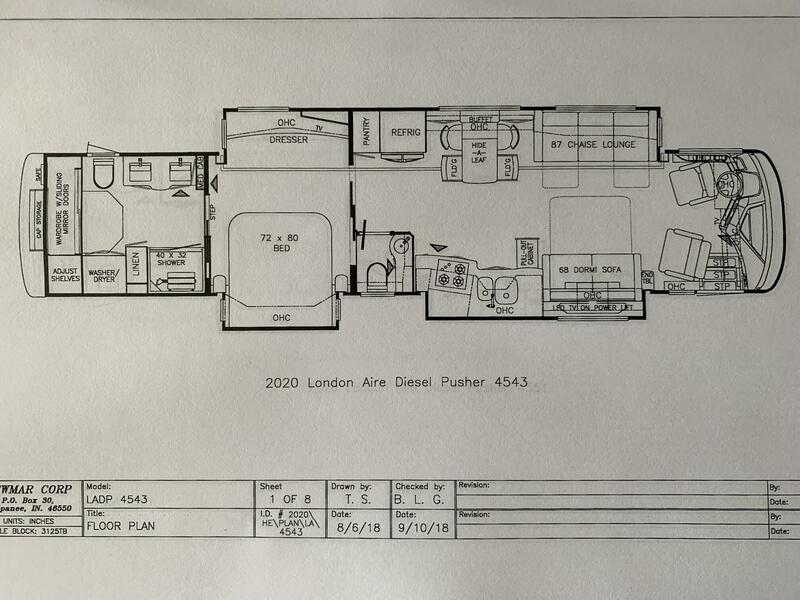 The London Aire 4533, 4535, 4543, 4551 and 4579 are carry over floor plans for 2020. The London Aire 4550 and 4534 models are discontinued for the 2020 model year. 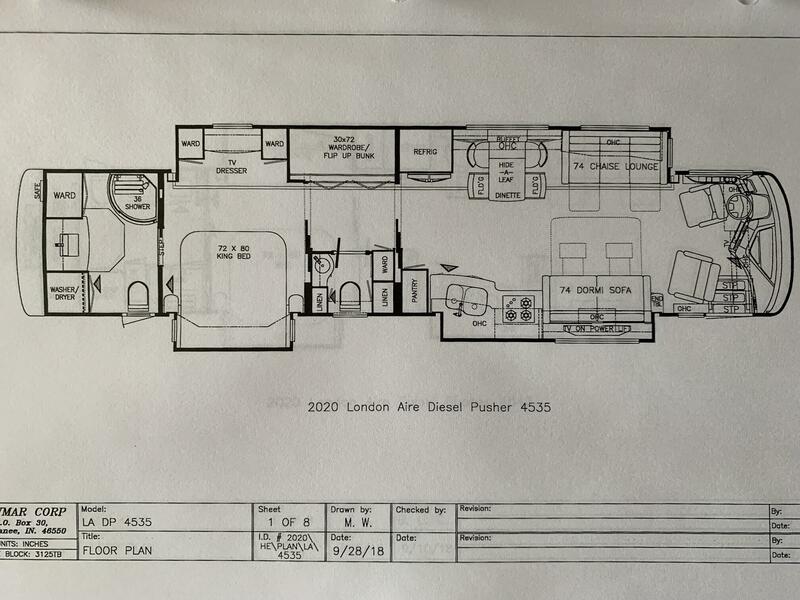 These floor plans are replaced with 2 new offerings. 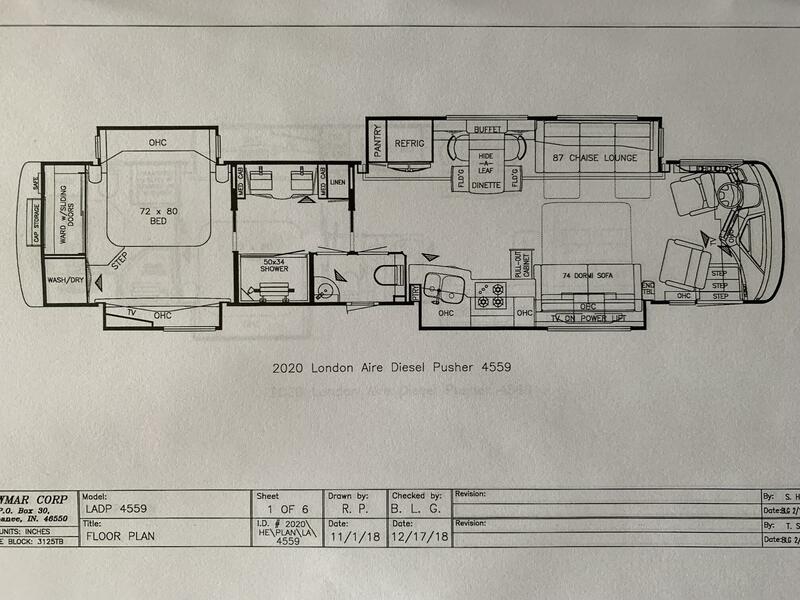 These are the 4559 and 4569 floorplans. The London Aire 4576 has also no longer available for 2020. 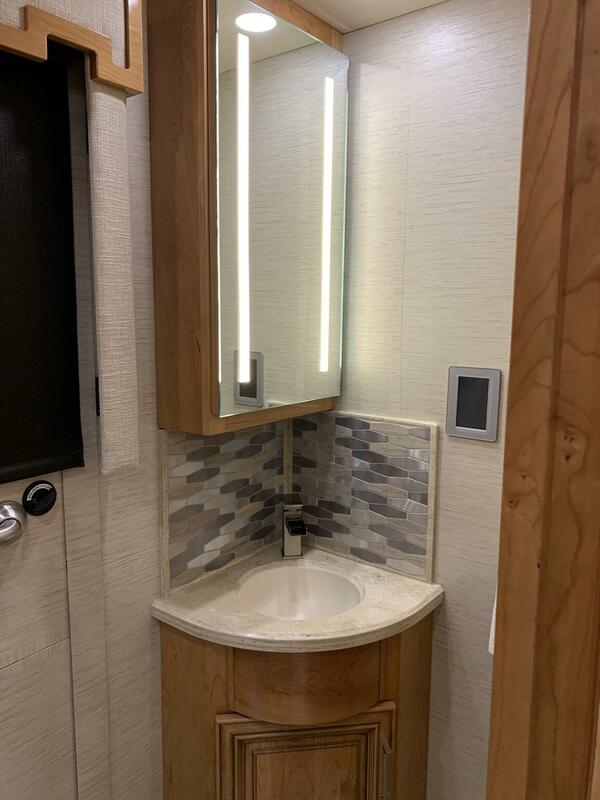 The new London Aire 4559 takes the basic footprint of last year’s 4550 mid bath footprint, and adds a 3rd bathroom sink in the enclosed commode area, as well as entry points from both the front living area as well as the bath area. 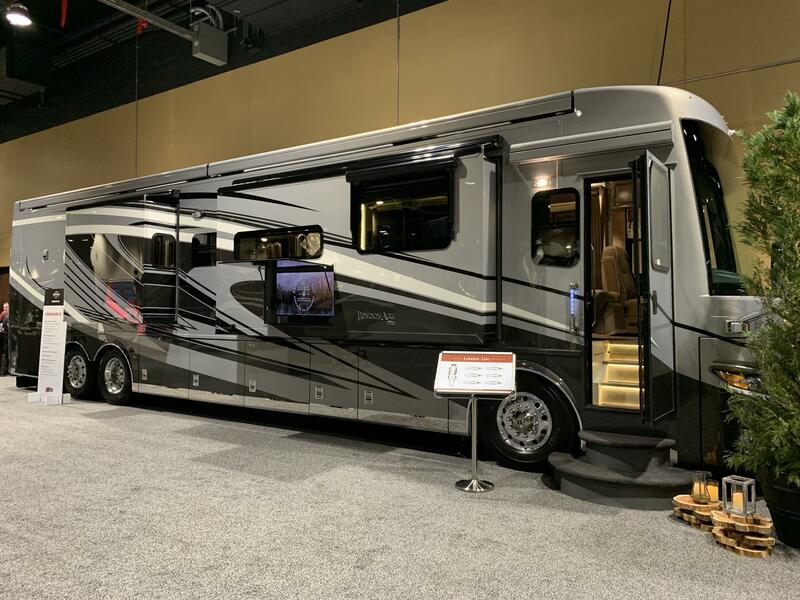 The new 2019 London Aire 4559 is a quad slide with the bedroom in the back of the motor home. 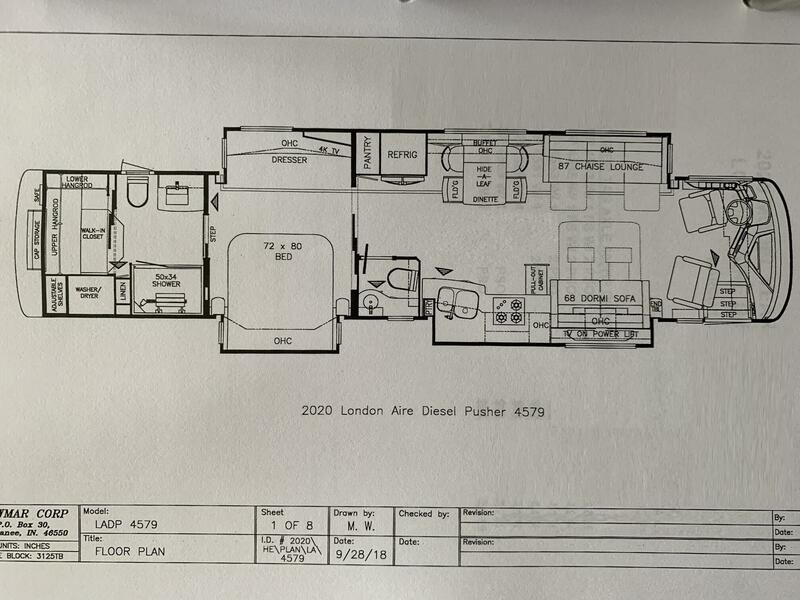 The front living area has an 87” chaise lounge and dining table with chairs, as well as a residential refrigerator and pantry located in the off door side slide room. 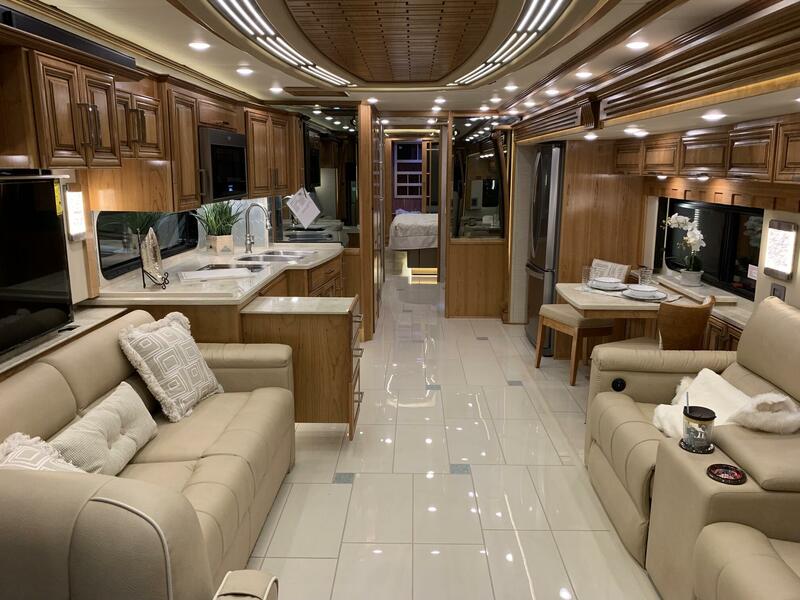 The door side slide room contains a 74” Dormi sofa sleeper with “televator” and kitchen that is well laid out and now offers a pull out cabinet. There is also a large 50” X 34” shower with fold down seat. 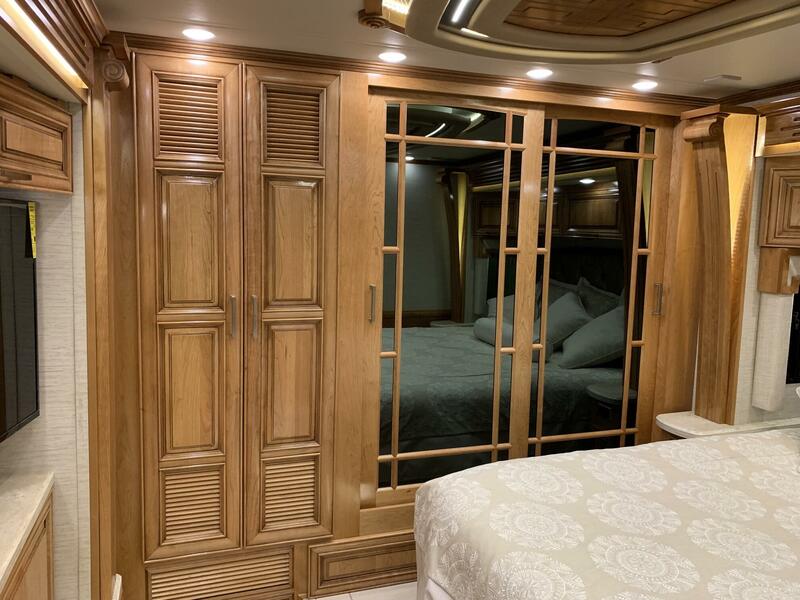 The bedroom has a king bed across from a dresser and TV and a large wardrobe along the rear wall offering ample full hanging space and can house the optional 2-piece washer and dryer. The London Aire 4569 is a modified version of the 2019 London Aire 4534 model, which it replaces. 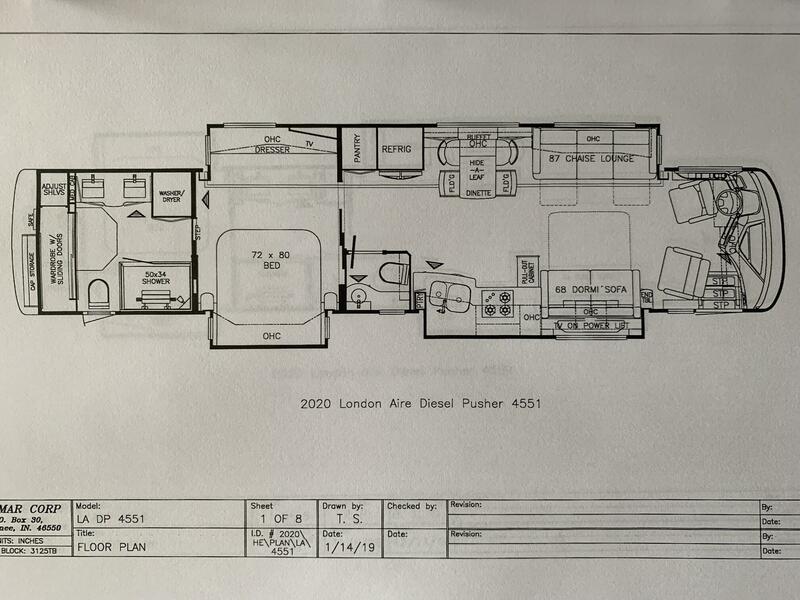 The 4569 remains a bath and a half model with a full wall slide and U-shaped kitchen. 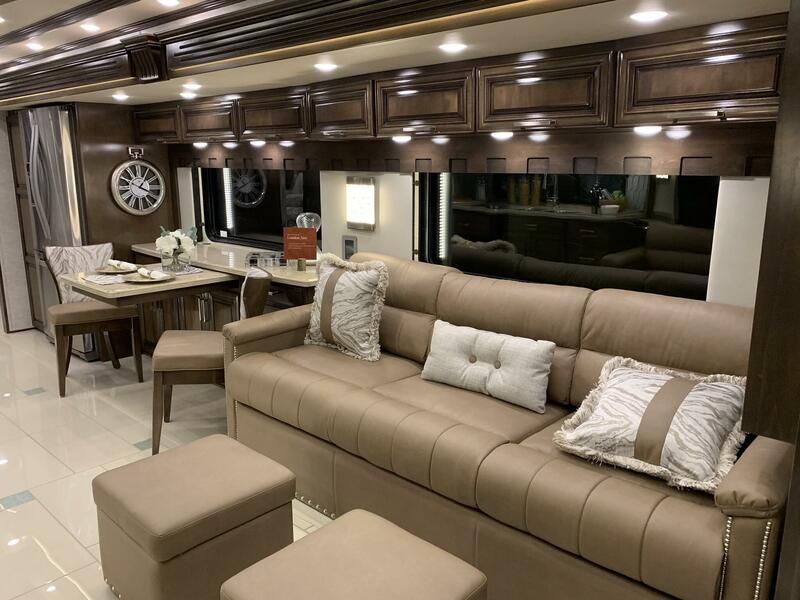 The front living area features an 87” chaise lounge and hide-a-leaf dinette with chairs (wider than the dining area in the 4534) on the off door side. An opposing 68” Dormi sofa sleeper with “televator” and U-shaped kitchen are located door side. 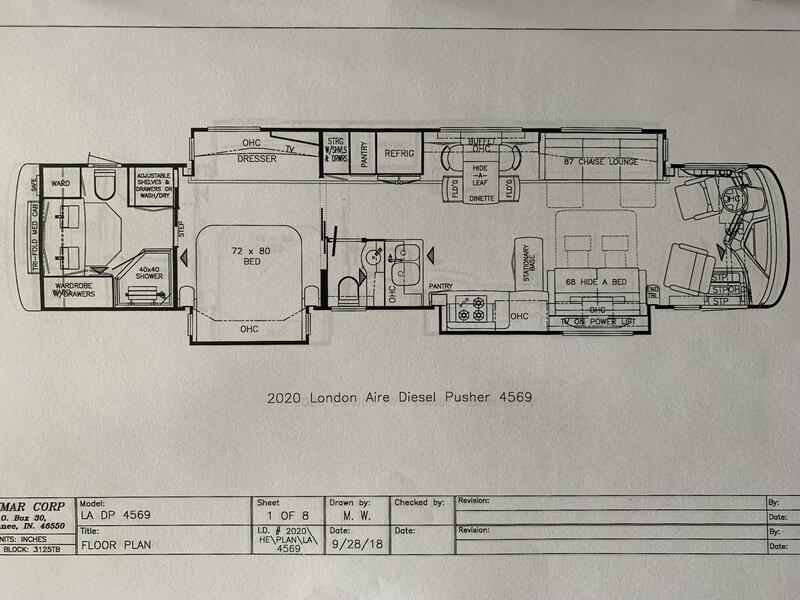 Mid-ship, the refrigerator and pantry, as well as the wardrobe with shelves and drawers (smaller than the one in the 4534 floor plan) is situated on the off door side, with the half bath located on the door side. The bedroom has a king bed across from a dresser and TV. 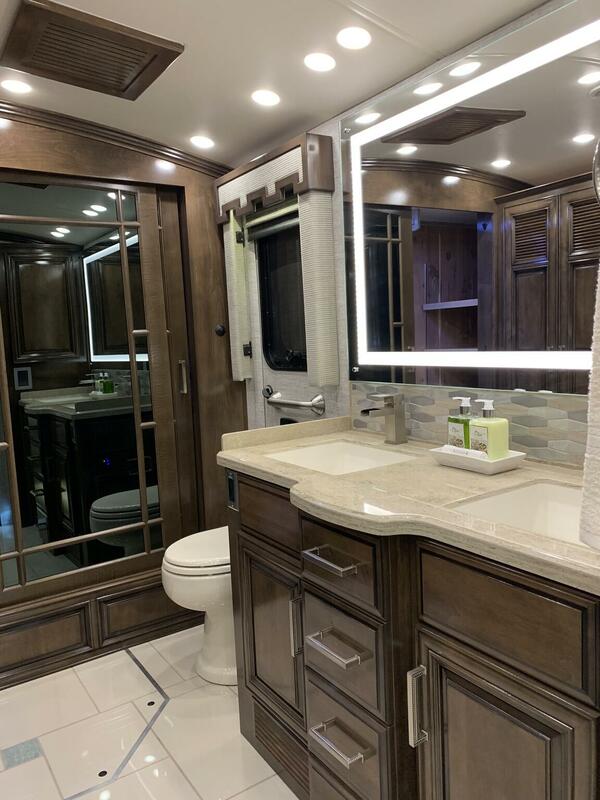 Rear of the bedroom is the master bath which offers a 40” X 40” glass enclosed shower, washer & dryer, and a two sink vanity with two wardrobes on each side along the rear wall. The wardrobe on the door side of the rear master bath is larger it was in the 4534 in 2019 in that it extends forward all the way to the shower wall. This provides more total storage space in the rear bath of the new 4569. The 2020 London Aire will feature a JBL Slimline subwoofer that is more compact and easier to fit when installed under the dash area. Samsung replaces Sony brand televisions in London Aire for 2020. The option for the Xite HD 360 camera system offered in 2019 is a standard feature in 2020 (used on 93% of all London Aire orders in 2019). 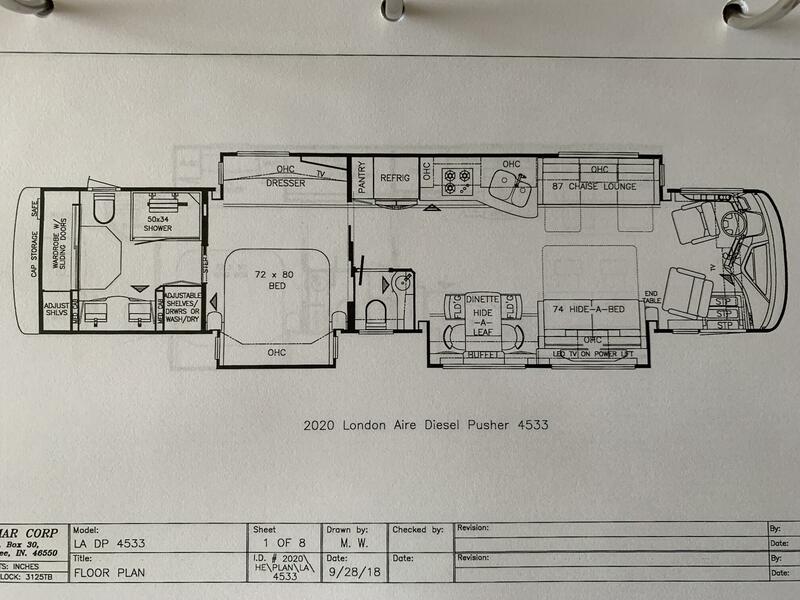 There are travel latches on the pantry doors of the 2020 London Aire. In select floor plans, the master bathroom vanity cabinet base will feature tip out storage on the exposed end of the cabinet. For 2020, soft close cabinet doors are a standard feature in London Aire. The pull out drawer in kitchen overhead cabinets has been redesigned so as to maximize the available storage space where these are offered. The driver and passenger seats will have a newly designed arm rest adjustment lever. The Comfort Drive Steering control has been relocated to the steering wheel and is operated through the menus on the glass dash on the Freightliner and Spartan chassis. The 2020 London Aire features a new steering column and steering wheel on Freightliner chassis. This new design relocates the wiper controls to the turn signal stalk in addition to moving the transmission and engine brake controls to stalk on the right hand side of the column. Tire pressure monitoring system is a standard features on all 2020 London Aire models. The optional Spartan chassis on the 2020 London Aire will be equipped with 60 millimeter shocks to provide better ride quality. A new key fob programming switch, located under the access panel on top of the dash, is available on the optional Spartan chassis. This provides an easier way for a technician to program a new key fob for the keyless ignition system in the event a fob needs to be replaced. The On Guard collision mitigation and adaptive cruise system that was optional on the 2019 London Aire has been made standard for 2020. An electrical switch for the brake pedal has been added to allow the push button start to be engaged. A wireless cell phone charging pad has been added to the passenger console of the 2020 London Aire. The optional transfer switch surge protector offered as an option in 2019 is a standard feature for 2020. The 2020 London Aire has a new Silverleaf display with larger screen. A lighted mirror replaces vanity lights in the bath area. 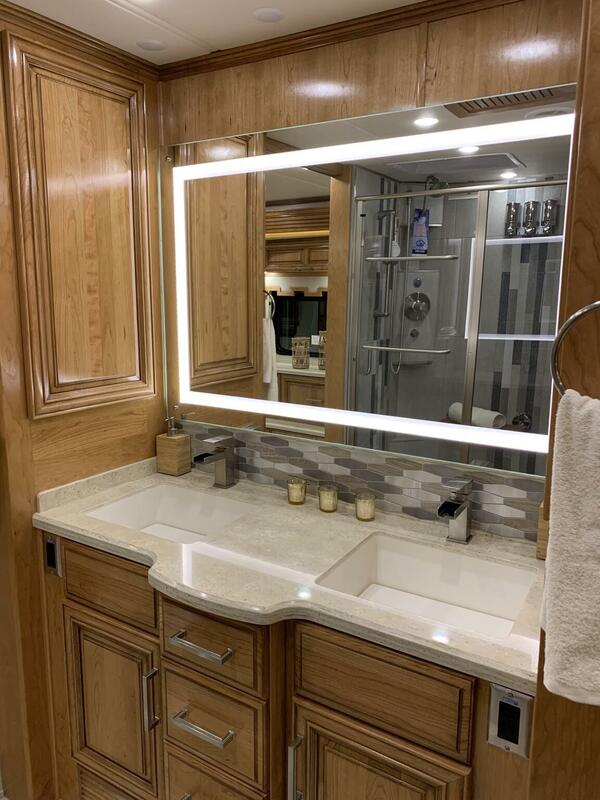 In addition, smaller LED lights have been added in the ceiling over the vanity for additional light. 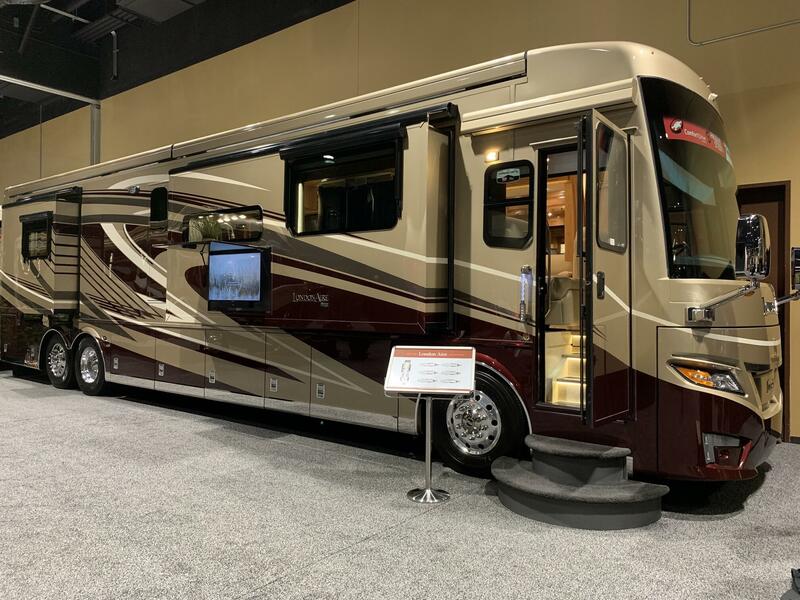 The 2020 London Aire will feature new exterior graphic and paint colors. The diesel exhaust fluid (DEF) tank cap is tethered to the DEF fill door. This new design allows the cap to hang down without contacting the body and avoids damaging the paint finish. The optional chrome baggage door handles offered on London Aire in 2019 are standard for 2020. The latest version of the HWH entry step has been added to the 2020 London Aire. The new design includes lights at each step, better wire routing that is well concealed, as well as a new ground contact switch along with other improvements. The rear wardrobe in the bedroom of the 2020 London Aire will feature larger shoe storage on select models. LED strip lighting above the kitchen slides will include lighting above the sofa and dinette areas (except for the 4533 floorplan). The kitchen of the 2020 London Aire (where the optional kitchen window is not present) will feature a new concealed LED lights above to illuminate and highlight the inserts. 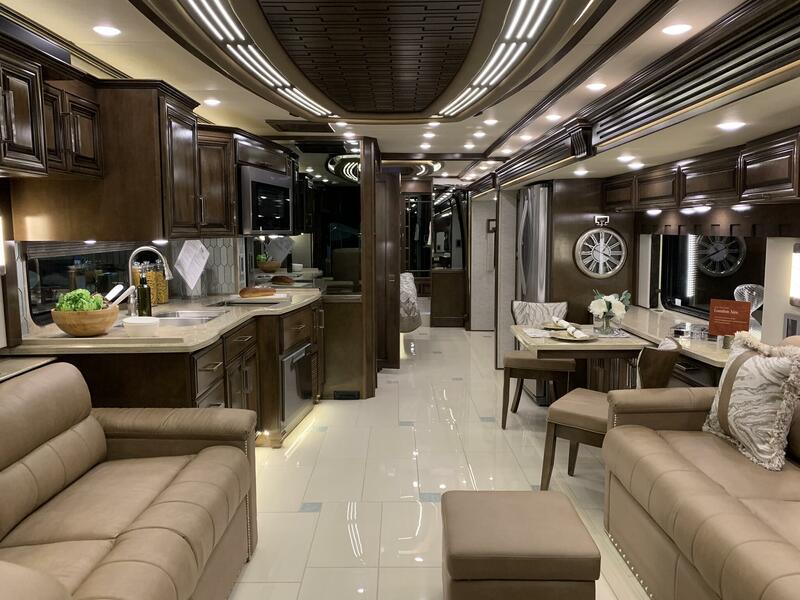 A redesigned feature ceiling will be the highlight of interior design of the 2020 London Aire. A tiled foot prop has been added to the shower in the main bath of the 2020 London Aire. 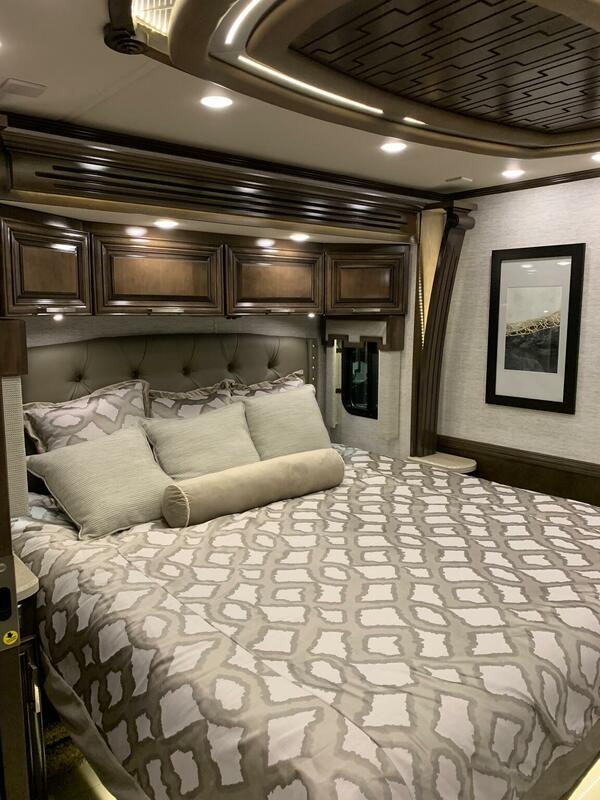 The driver & passenger cup holders will be illuminated like they are in the 2019 King Aire. New for 2020, a towel bar is attached directly to the shower door. The location of the shower head mount and the shower hose installation have been changed for 2020. 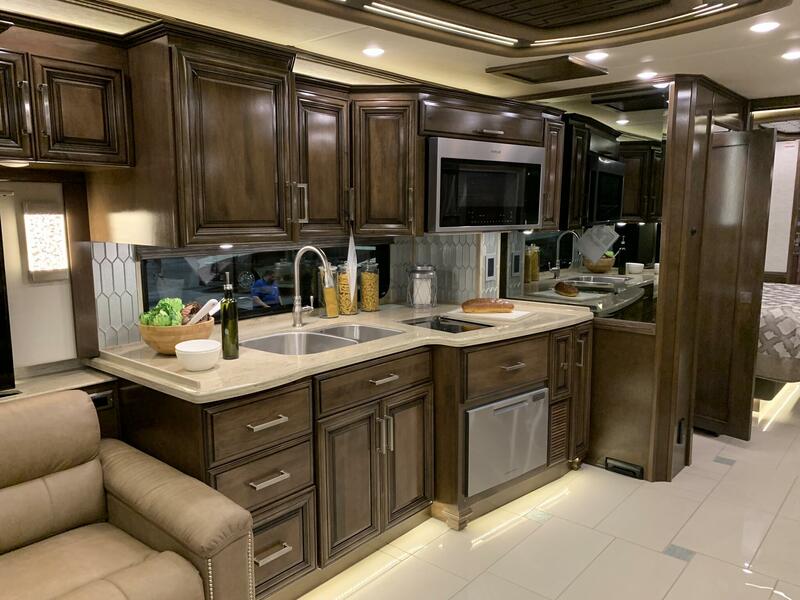 When the optional kitchen window is selected, the kitchen window shade is recessed into the bottom of the overhead cabinet and the window valence has been eliminated, to allow for larger windows where possible and let more light into the galley area. A universal toll module is a new option available on London Aire for 2020. A new option for a passenger side monitor at the console (similar to what has been offered in King Aire and Essex) is available for the 2020 London Aire. 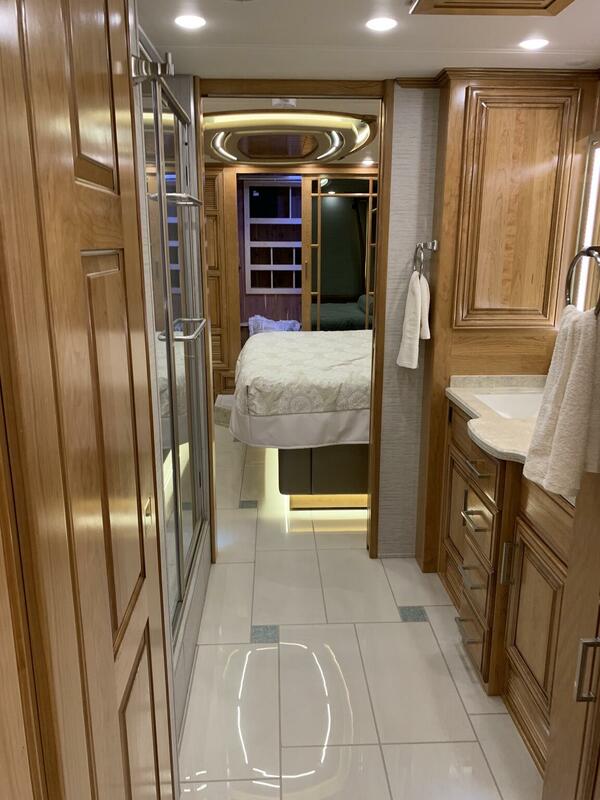 LED strip lighting under all slides on the off door side of the 2020 London Aire is a new available option. A Curt Spectrum brake controller is a new option on the 2020 London Aire built on the optional Spartan chassis. This provides an auxiliary brake control system with the controls integrates into the instrument panel (rather than mounted under the dash when done after-market). This brake controller option is not available on the standard Freightliner chassis. A new Villa theater seat measuring 87” is a new option on the 2020 London Aire.